Media captionWhat does it take to make a huge St David from flowers? Welsh artist and Britain's Got Talent finalist, Nathan Wyburn, created the portrait within the central courtyard of St Davids Bishop's Palace. It comes as part of heritage group Cadw's Rediscover History campaign. 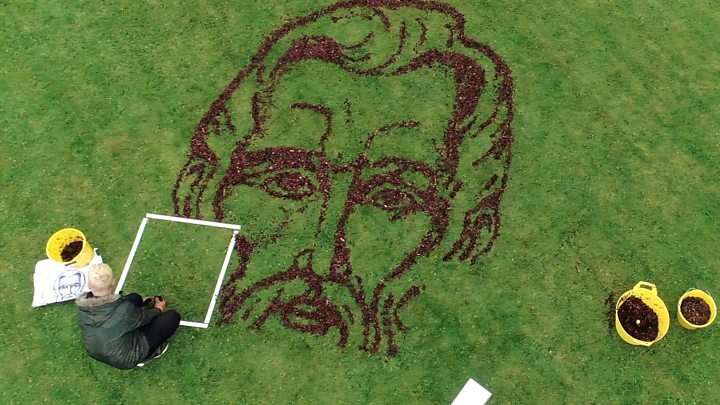 The final piece took more than six hours to create and measures 11m (36ft) by 8m (26ft). Wyburn's previous work includes depicting the Queen in marmite on toast, and NHS founder Aneurin "Nye" Bevan in soil and white stone dust.